"Fifty years ago, on October 29, 1956, 49 Palestinian residents of Kafr Qasem were murdered by Israeli border police who at that time were officially attached to the military. Countless more were wounded and left bleeding and unattended. Their families were unable to offer aid because of a 24 hour curfew lasting for some two days and three nights. Violation of the curfew was punishable by death... This deliberate massacre had been planned in advance to coincide with the Israeli and Anglo-French attack on the Suez canal." 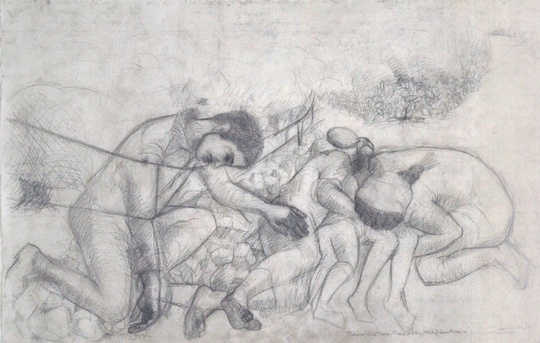 (Picture and text by Samia A. Halaby, "MEMORIAL on the 50th Anniversary of the Kafr Qasem Massacre", 1998; see also: "Drawing the Kafr Qasem Massacre", Amsterdam, 264p., Schilt Publ., 2016. OnSamia Halaby and her art: click here). Protest motion from BACBI CC (17/03/2019): "The coordinating committee of BACBI, the association of Belgian academics and cultural workers in solidarity with Palestine, strongly condemns the violent intervention of the Berlin police against Ms. Rasmea Odeh, a Palestinian former prisoner and renowned activist. At the request of, among others, the American and Israeli ambassadors and complying with the witch-hunt against her by the German extreme right, she has been physically prevented by the police from speaking at a meeting calling for the liberation of Palestinian women in Israeli captivity. A visa that had been granted to her has been revoked and she was prohibited from political activity. This unacceptable crackdown on her and on a peaceful manifestation is a stain on Berlin's reputation as a beacon of democracy, anti-racism and freedom of expression." In mei zullen de camera's op het Eurovisionfestival in Tel Aviv gericht zijn, terwijl het zich voltrekt bovenop de ruïnes van verdwenen Palestijnse dorpen. Als het Eurosongfestival al een apolitiek imago beoogt, dan dient het hier als rookgordijn om onze blik aan schending van mensenrechten te onttrekken. "Palestinian Civil Society Calls on the UN High Commissioner to Release the UN Database of Businesses Engaged in Activities Related to Israeli Settlements" (Al-Haq, Feb 28). For the Letter (pdf, 4p. ): click here! On Thursday, 28 February 2019, more than 200 Palestinian non-governmental organisations, trade unions, and institutions, endorsed by several regional and international human rights organisations, sent a letter to the UN High Commissioner for Human Rights. 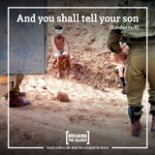 # Brx, Thursday, March 21, 18h-21h: "Belgian money for Israeli Weapons?" Org. : Intal Globalise Solidarity & Intal Palestina Brussel. In cooperation with ECCP – European Coordination of Committees and Associations for Palestine. Venu: Haachtsesteenweg 53, 1210 Sint-Joost-ten-Node. Speakers: David Cronin, Ewa Jasiewicz, Jean Guy Greilsamer. See Facebook. 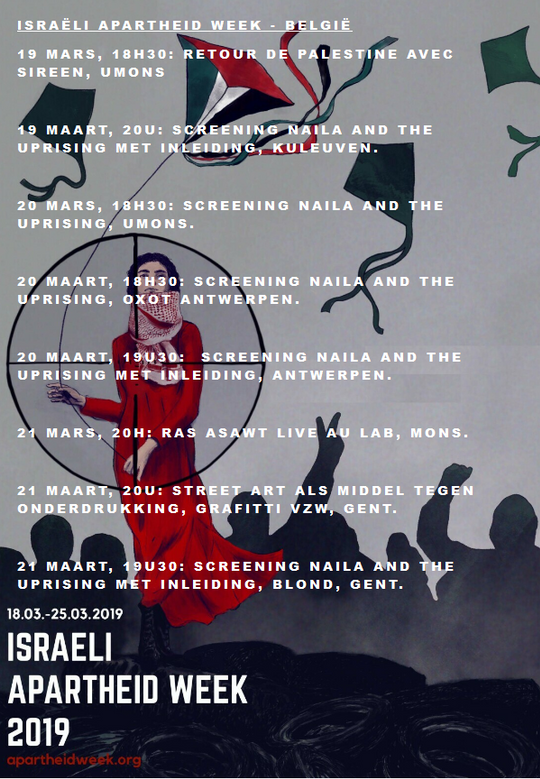 As a part of the Israeli Apartheid Week 2019, Intal Globalise Solidarity invites you to an event discussing Belgian complicity in Israel's war crimes against the Palestinian people. 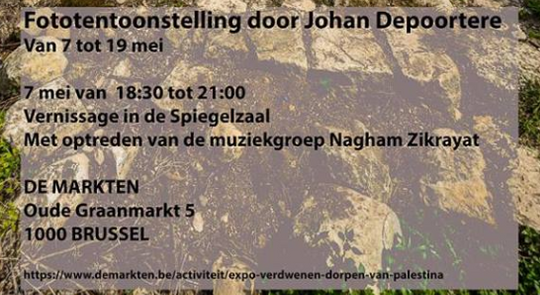 # Tournai, samedi le 23 mars 2019, 14:00 - 22:00: " 8 heures pour Mustapha Awad." Lieu: La Petite Fabriek, Rue du Moulin 16, 7503 Doornik. Org. : Free Mustapha & ABP Wallonie picarde. Programme : 14 h : Accueil --15 h : Théâtre "Made in Palestine" par le théâtre Croquemitaine -- 16 h 30 : Danses par Raj'een Dabkeh Group, la troupe de Mustapha -- 18 h : Conférence de Léa Tsemel, son avocate israélienne -- 20 h : Repas (sur réservation avant le 18 mars : wapi@abp-wb.be) et musique palestinienne par Alaa Shublaq, de Gaza. The UNHRC report details the most outrageous conduct by a government engaged in entirely punitive acts and killing civilians in the process. Israeli officials have never killed Palestinians for the sake of justice or international law; they almost always do so purely for the sake of revenge or to quell their anger. This is not the behaviour of a law-abiding democratic state. Violence, it seems, is fundamental to Israel's "democracy", and always has been. 'De visie van Oslo is nog altijd geldig vandaag, ook al zijn velen de principes en doelstellingen ervan vergeten.' Een week geleden pende Federica Mogherini, hoge vertegenwoordiger van de EU voor Buitenlandse Zaken, liefst vier volle pagina's bij elkaar in The Cairo Review, in een pleidooi om de hoop voor vrede in het Midden-Oosten zuurstof te blijven toedienen. Nadat in de afgelopen maanden diverse Europese staten, waaronder Nederland, Hongarije en Frankrijk, in rap tempo achter elkaar de (IHRA-) definitie over antisemitisme hadden aangenomen, leefde de discussie in alle hevigheid op, ook in NRC. Te meer toen de Israëlische premier Benjamin Netanyahu deze landen daarvoor prees. De Israëlische premier Netanyahu omarmt drie extreem-rechtse partijen om zich op die manier van een meerderheid te verzekeren na de verkiezingen die op 9 april moeten plaatsvinden. "Joods fascisme" noemt de liberale krant Haaretz de nieuwe coalitiepartners die de premier al een post in de volgende regering heeft beloofd. Palestinian-American artist Samia Halaby's spacious loft-studio in New York's TriBeCa neighborhood is a sanctuary from the noise and bustle of New York City. The walls of the kitchen are painted in the same speckled style as many of her canvases and books and dictionaries in multiple languages line shelves that snake their way back to the studio. In the early morning of Wednesday 27th of February, the Israeli Occupation forces arrested Zakaria Zubeidi one of the founders of the Freedom Theatre and one of the students of the Stone Theatre, that was destroyed during the second Intifada. Zakaria co-founded The Freedom Theatre with Juliano Mer-Khamis who was murdered outside the theatre on the 4th of April 2011. In cash-stripped Gaza, opportunities are few for a youth band. There aren't many festivals and sponsors, and instruments are either not available or too expensive, and even a studio to practice may be a luxury. Gaza's Sol Band makes his voice heard in concerts and on the internet, but an album just needs to wait. 'Sard' (the word means "to narrate") is a Ramallah-based creative initiative geared toward forging a community of young writers, poets and musicians in the West Bank. They read short stories, present songs, rap, perform skits and create visual works of art. Muhammad Salem Jadallah and Muhammad Asad, both based in the besieged Gaza Strip won awards at the 76th Pictures of the Year International (POYI) of the Missouri School of Journalism in Columbia, Missouri, United States, one of the most prestigious schools of journalism worldwide. Palestinian Israeli artist Abu Shakra came from a family of prominent artists in Umm al-Fahm and took to projects that focused on Palestinians' connection to their lands. (He) was the first Palestinian to study at an Israeli artschool, an opportunity funded by a pair of Holocaust survivors. The Israeli-Palestinian artist Nasreen Abu Bakr, due to participate in an exhibition called "The Moon's Reflection on the Asphalt," at the Beit Hagefen Arab-Jewish cultural center in Haifa, underwent what she called a "degrading, exhausting and bizarre interrogation" by El Al airlines security personnel at the Berlin airport. The Ministry of National Economy in the West Bank city of Ramallah recently launched a competetion targeting women working in the food industry in order to encourage their efforts and support national products. A Sinn Féin Senator has claimed Israel is using the Eurovision song contest to "present its prettier face and to whitewash and distract attention from war crimes". Fintan Warfield called for an Irish boycott of the contest as RTÉ prepares to announce the country's entry for the 64th annual competition, which takes place in Tel Aviv on Saturday May 18th. Un scandale chasse l'autre au pays de l'apartheid : après l'annonce de la prochaine inculpation du Premier Ministre Netanyahou pour corruption, voilà que la direction de la télé publique décide l'arrêt de la vente des billets pour la finale de l'Eurovision, pour cause de fraude massive ! Iceland's representative for this year's Eurovision Song Contest, Hatari, may be banned from entering Israel, if the Israeli "lawfare" organisation Shurat HaDin get their way. In a statement, Shurat HaDin's founder Nitsana Darshan-Leitner said: "We received information that the band representing Iceland supports a boycott of Israel." American award-winning singer, songwriter, and producer, John Legend, recently spoke out about standing up for human rights for Palestinians while on the "Real Time With Bill Maher" show. They're seized in the dead of night, blindfolded and cuffed, abused and manipulated to confess to crimes they didn't commit. Every year Israel arrests almost 1,000 Palestinian youngsters, some of them not yet 13. On February 13, 2019, Israeli forces arrived near the village of a-Tuwani in the South Hebron Hills. The forces used excavating equipment to unearth and destroy stretch of pipe, which was laid just months ago and supplied water to over 1,000 Palestinians. Residents say that without the system, "water has become every family's largest expense." It is this Israeli exceptionalism that is so striking. The more violent Israel becomes towards the Palestinians and the more intransigent in rejecting peace, the less pressure is exerted upon it. Not only does Israel continue to enjoy generous financial, military and diplomatic support from the US and Europe, both are working ever harder to silence criticisms of its actions by their own citizens... The hypocrisy of these states - urging peace in the region while doing their best to subvert it - is clear. Now the danger is that UN leaders will join them. South African President Cyril Ramaphosa has said that his government is planning to downgrade its diplomatic mission to Israel. This, he said, comes in response to recommendations from the National Conference of the National African Party which was held more than a year ago, Safa news agency reported yesterday. The UN Independent Commission of Inquiry on the protests in the Occupied Palestinian Territory today presented its findings. The report focuses on the demonstrations in the Gaza Strip. 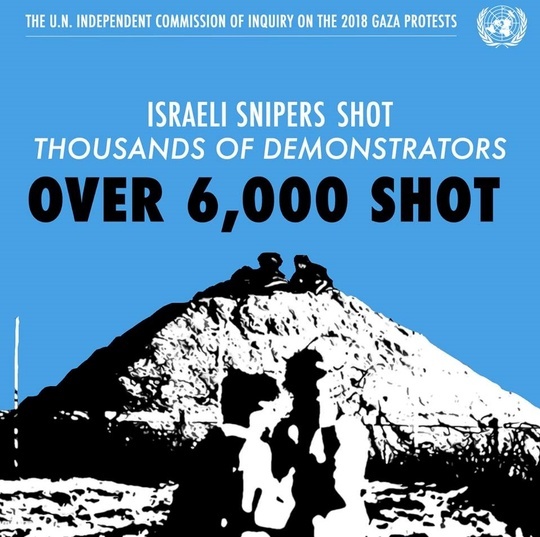 "The Commission has reasonable grounds to believe that during the Great March of Return, Israeli soldiers committed violations of international human rights and humanitarian law. Some of those violations may constitute war crimes or crimes against humanity, and must be immediately investigated by Israel," said the Chair of the Commission, Santiago Canton of Argentina. 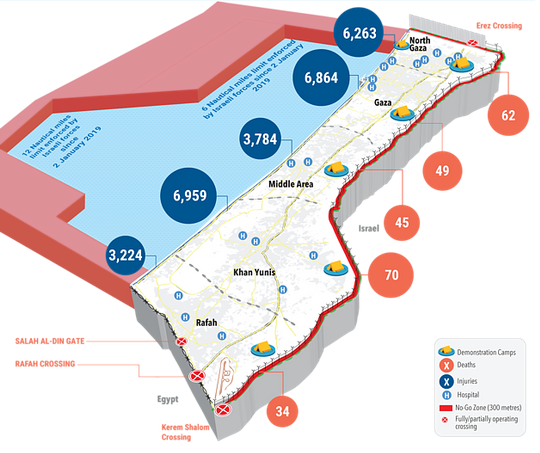 Since 30 March 2018, the Gaza Strip has witnessed a significant increase in Palestinian casualties in the context of mass demonstrations and other activities along Israel's perimeter fence with Gaza, taking place as part of the "Great March of Return" (GMR), as well as during hostilities and access related incidents. 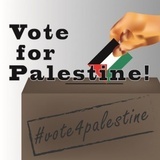 Eleven unrecognized Bedouin villages in Israel's Naqab (Negev) southern desert region have no polling stations or public transportation and some of their thousands of residents will have to travel up to 50 kilometers to vote in the upcoming national elections on 9 April 2019. PM has been accused of demonising Israeli Arabs in lead-up to April election. "Israel is not a state of all its citizens," he wrote in response to criticism from an Israeli actor, Rotem Sela. "According to the basic nationality law we passed, Israel is the nation state of the Jewish people - and only it." We must stand with the Palestinian women in Jerusalem who are suffering at the hands of the Israeli occupation of the Holy City. Jerusalemite women have been and still are the first line of defence in Jerusalem against the Israeli occupation, which aims to expel them, their children and their husbands from their own land so that the Muslim and Christian Arab presence in the city is erased without a trace. One of the most insidious aspects of Israel's military occupation is also one of its most overlooked: its deliberate fragmentation of Palestinian society. While the spectacle of violence is typically the focus of media attention - when international media cover Israel's oppression of Palestinians at all - the reach of Israeli control over Palestinian family life falls under the radar. On February 18, members of extremist Jewish groups raided the Al-Aqsa Mosque compound in Occupied Al-Quds (Jerusalem). They clashed with Palestinian worshippers, as the settlers attempted to shut down the gate of Al-Aqsa itself. The clashes involved the Israeli army and police as well, who opened fire and brutally assaulted Palestinians, leading to scores of injuries. Palestinian national leader, parliamentarian, feminist and leftist Khalida Jarrar was released early Thursday morning, 28 Feb, after 20 months of imprisonment without charge or trial under administrative detention. In an interview [video below with English subtitles] given immediately after her release, Jarrar said that "the prisoners are an integral part of the Palestinian people's movement, and their message is always unity." @ UN HRC: "Report of the independent international commission of inquiry on the protests in the Occupied Palestinian Territory." UN Human Rights Council, 40th session, 25 February-22 March 2019, Agenda item 7, Human rights situation in Palestine and other occupied Arab territories (pdf, 22p.). Israel's exploitation of natural resources in the Occupied Palestinian Territory for its own use is in direct violation of its legal responsibilities as an occupying power, says UN Special Rapporteur Michael Lynk... "Israeli practices in relation to water, extraction of other resources, and environmental protection, raise serious concerns. With the collapse of natural sources of drinking water in Gaza and the inability of Palestinians to access most of their water sources in the West Bank, water has become a potent symbol of the systematic violation of human rights in the Occupied Palestinian Territory," the Special Rapporteur said. @ "Between the Hammer and the Anvil: Women's Right to Health in the Gaza Strip" (Physicians for Human Rights-Israel, March 2019). Author: Mor Efrat. A new report by PHRI issued to mark International Women's Day reveals how the closure of Gaza and the criteria for granting exit permits affect women patients, among other things due to delays and unresponsiveness by the Israeli authorities, women's relatedness to family members residing outside the Gaza Strip, or their relatedness to members of Hamas. For the report (pdf, 19p. ): click here! In 2018, 474,250 inciting posts against Palestinians were written. Legislation about the Nation-State Law was the main engine of racism for hate speech via Facebook. Palestinian politicians and Palestinians Citizens of Israel are most vulnerable to incitement. The results of the Index of Racism and Incitement in Israeli social media, released annually by 7amleh - The Arab Center for the Advancement of Social Media, shows a staggering rise in incitement and Israeli racism against Palestinians on social networks in the past year (2017 - 2018). Every morning, before dawn, tens of thousands of Palestinian workers cross Israeli military checkpoints on their way to their workplaces, in Israeli and Palestinian cities beyond the Green Line. There are some 11 checkpoints through which Palestinians with Israeli work permits can cross into Israel. They are overcrowded and humiliating, lacking infrastructure and sanitation. Due to their extreme confinement in such small places, some Palestinian labourers have been crushed to death. @ BROCHURE 2019 : "Enfances brisées - Les enfants palestiniens, cible privilégiée de la répression israélienne" (Plateforme des ONG françaises pour le Palestine, 5 février 2019): format A5, 38 p., éd. janvier 2019, 2 EUR l'exemplaire (1 EUR plus de 10 ex.). La Plateforme Palestine publie une nouvelle brochure sur les détentions d'enfants palestiniens, tirée du rapport " Enfances brisées " publié en 2016 et soumis au Comité contre la torture de l'ONU qui était le fruit d'une recherche de terrain et de témoignages d'enfants et de leur famille. UN condemns Israel as Palestinians bury their dead: The truth is out about Israel's lethal actions in Gaza. Will the world listen? Coordinating Committee: Prof. ém. Marie-Christine Closon (UCL), Prof. Patrick Deboosere (VUB), Prof. Lieven De Cauter (KULeuven), Em. Prof. Herman De Ley (UGent), Em. Prof. Marc De Meyere (UGent), Prof. Serge Deruette (UMons), Lieve Franssen (dir. Brussels Brecht-Eislerkoor), Carl Gydé (director CAMPO), Prof. Perrine Humblet (ULB), Prof. Marc Jacquemain (ULiège), Em. Prof. Madeline Lutjeharms (VUB), Raven Ruëll (metteur en scène), Prof. ém. Christiane Schomblond (ULB), Dr. Nozomi Takahashi (UGent), Prof. Karin Verelst (VUB).